Definition at line 3529 of file winuser.h. Definition at line 3534 of file winuser.h. Referenced by add_message_(), co_WinPosDoWinPosChanging(), co_WinPosSetWindowPos(), COMBOEX_WindowPosChanging(), create_custom_header_control(), create_header_control(), handle_internal_message(), HEADER_Layout(), IntDeferWindowPos(), IntEndDeferWindowPosEx(), LISTVIEW_SetView(), LISTVIEW_StyleChanged(), LISTVIEW_UpdateSize(), main_window_procA(), mdi_child_wnd_proc_2(), mdi_main_wnd_procA(), OnSetFont(), CAddressBand::OnWindowPosChanging(), FileChildWindow::resize_children(), resize_tree(), SPY_DumpStructure(), test_comboex_WM_WINDOWPOSCHANGING(), WINHELP_ButtonBoxWndProc(), and WinPosFixupFlags(). Definition at line 3535 of file winuser.h. Definition at line 3536 of file winuser.h. Referenced by add_message_(), co_WinPosDoNCCALCSize(), co_WinPosDoWinPosChanging(), co_WinPosSetWindowPos(), COMBOEX_WindowPosChanging(), DesktopWindowProc(), DWPTestProc(), handle_internal_message(), HEADER_Layout(), IntDeferWindowPos(), IntEndDeferWindowPosEx(), LISTVIEW_SetView(), LISTVIEW_StyleChanged(), LISTVIEW_UpdateSize(), main_window_procA(), mdi_child_wnd_proc_2(), mdi_main_wnd_procA(), ME_HandleMessage(), CTrayWindow::OnNcCalcSize(), OnPostWinPosChanged(), OnSetFont(), OwnerTestProc(), FileChildWindow::resize_children(), resize_tree(), SPY_DumpStructure(), sw_call_window_proc(), SysParamsTestProc(), test_comboex_WM_WINDOWPOSCHANGING(), and WinPosFixupFlags(). Definition at line 3530 of file winuser.h. 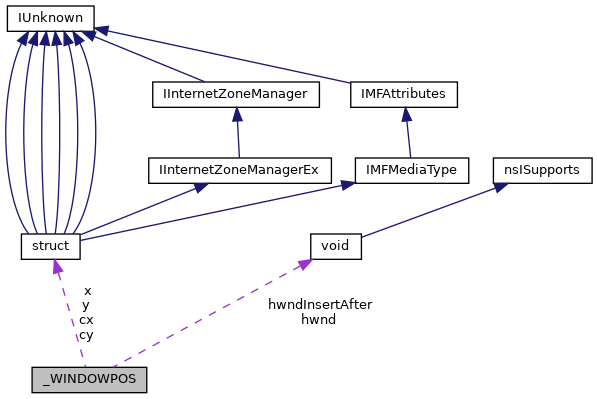 Referenced by co_WinPosDoWinPosChanging(), co_WinPosSetWindowPos(), HEADER_Layout(), IntDeferWindowPos(), IntEndDeferWindowPosEx(), LISTVIEW_UpdateSize(), mdi_child_wnd_proc_2(), mdi_main_wnd_procA(), OnSetFont(), SPY_DumpStructure(), test_comboex_WM_WINDOWPOSCHANGING(), and WinPosFixupFlags(). Definition at line 3531 of file winuser.h. Referenced by add_message_(), co_WinPosDoWinPosChanging(), co_WinPosSetWindowPos(), create_custom_header_control(), create_header_control(), DWPTestProc(), handle_internal_message(), HEADER_Layout(), IntDeferWindowPos(), IntEndDeferWindowPosEx(), LISTVIEW_UpdateSize(), mdi_child_wnd_proc_2(), mdi_main_wnd_procA(), OwnerTestProc(), FileChildWindow::resize_children(), resize_template_hook(), resize_tree(), SPY_DumpStructure(), SysParamsTestProc(), test_comboex_WM_WINDOWPOSCHANGING(), and WinPosFixupFlags(). Definition at line 3532 of file winuser.h. Referenced by add_message_(), co_WinPosDoWinPosChanging(), co_WinPosSetWindowPos(), COMBOEX_WindowPosChanging(), create_custom_header_control(), create_header_control(), handle_internal_message(), HEADER_Layout(), IntDeferWindowPos(), IntEndDeferWindowPosEx(), LISTVIEW_SetView(), LISTVIEW_StyleChanged(), LISTVIEW_UpdateSize(), main_window_procA(), mdi_child_wnd_proc_2(), mdi_main_wnd_procA(), FileChildWindow::resize_children(), resize_tree(), SPY_DumpStructure(), test_comboex_WM_WINDOWPOSCHANGING(), and WinPosFixupFlags(). Definition at line 3533 of file winuser.h.